Tens of thousands of protesters took to the streets of several cities and towns in Morocco. Protesters were calling for an eradication of despotism and corruption. Despite royal efforts to contain the angst in the streets through proposed commission for constitutional reforms. Peaceful protesters specifically called for the abolition of said commission and for real, not cosmetic reforms of yesteryear. So far, political parties and civil society organizations have offered their own versions of proposed reforms to the constitution. Their proposals largely reflect the wide ranging demands for complete overhaul of the constitution including the (in)famous article 19 of the constitution that sets the king as the purveyor of both spiritual and temporal powers. This article does not give effective powers to the king, but endows him with a symbolic status above all political forces in the kingdom, as "Amir al-Mu'minin (commander of the faithful), the supreme representative of the nation and the symbol of unity..the guarantor the perpetuation and continuity of the State." Real reforms will have to focus on the principles of separation of powers and popular sovereignty. Setting those only as the backbone for a massive campaign to bring about accountability and transparency in the public sphere. This means dismantling the existing kleptocratic and nepotistic structure of government. The regime knows that whatever the constitutional revisions are in June will have to be vast in scope and radically different from earlier constitutional reforms. Moroccan society is growing anxious and bolder as they directly address their monarch with demands direly needed in a country placed to be a model for constitutional monarchism. This article is so innacurate. There is no way it was "Tens of thousands of people"
If your going to read news, you might aswell read it accurately. Thanks for your comment. I rely on different sources local and foreign, not just Reuters. 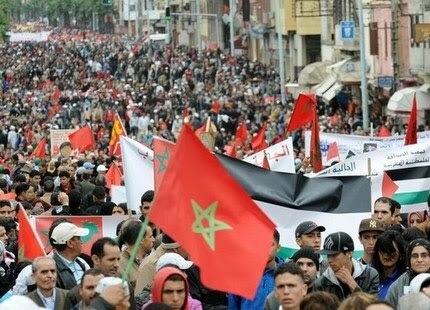 The consensus seems to be that protesters came out in in several cities and towns in Morocco. Le Monde, for instance, reported figures close to mine. I might be wrong on this, but to me (as a european) the morrocan king and also the emir of quatar seem to be the less evil, more wise monarchs/autocrats. I hope they understand the wind of change and manage a peaceful transation to a modern democratic society/constitutional monarchy. That way they would distinguish themselves from the Bahrain, Libya or Syria dictators and would be remembered and respected as positive figures (like the european monarchies). Good luck to all the democracy movements, you are amazing!!! I think you are right. The two monarchies are what we would call benign ones, in that they are not as brutal as some of the bunker states in the MENA (i.e Syria, Mubarak's Egypt, Gaddafi's Libya). That is why at the end of the post I alluded that the monarchy in Morocco is well positioned to establish a true constitutional monarchy, whereby the king reigns but does not rule. However, he has to show some political will to do so.